It’s 2044 and Joe crouches in a Kansas field practising his French as he waits for a man from the future to appear. He checks his pocket watch and slowly stands, gun ready. Time travel hasn’t been invented yet, but in thirty years it will be. Dangerous and unpredictable there is no dinosaur tourism, no retroactive killing of Hitler, and no confusing be-your-own-parent geneology. It’s outlawed, highly illegal and used only in secret by the mob. Joe is a Looper; a person from the present trained to erase people from the future. In a world that is poor, bleak and corrupt, Loopers live “the good life” – so long as they kill whoever is sent to them and promise to ultimately “close their loop”. Bound, with their heads covered, every Looper’s last victim will be themselves. 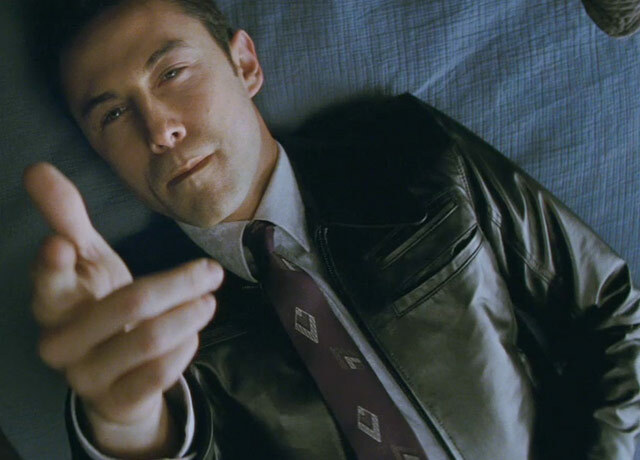 Written and directed by Rian Johnson, Looper blends science fiction, crime and action together in a story which is simultaneously adrenaline-filled and harrowing. It runs multiple plotlines together, subtly dropping hints about what is building, all while painting a picture of a dystopian future where most people are homeless, and vigilante justice is commonplace. The movie hinges on the relationship between the Joe of the present and the Joe of the future, played in his younger incarnation by Joseph Gordon-Levitt, and as his older self by Bruce Willis. Willis is no stranger to films where he encounters a younger version of himself (12 Monkeys, The Kid) and Gordon-Levitt has come a long way since Third Rock From The Sun (and his French has vastly improved since 10 Things I Hate About You). While his face is plastered in prosthetics to make him a more convincing young Willis, his inflection, voice and mannerisms are eerily spot on; I’m still not entirely convinced that they didn’t just dub Bruce Willis’s voice over his in the opening scene. Paul Dano also makes a short but meaningful appearance in the film, in a role almost as far removed from Ruby Sparks as you can get. The theme of travelling through time resonates with audiences because we all have at least one huge regret we’d like to undo, one life event we’d like to experience again, or people we’ve lost who we’d like to spend some more time with. Time travel in books, film and television has a special place in my heart. If done well, I will buy the t-shirt, hit up the internet, and repeatedly shoehorn it into mostly unrelated conversations, where I will spend uncomfortably nerdy lengths of time debating plot points and discussing ways around paradoxes. If done poorly, in all honesty I’ll probably still do all of the above, just (probably) minus the t-shirt. It would have been easy for this film to slide into being an action epic with a bit of time travel thrown in for ‘what the hell, why not’, but instead it is cleverly constructed, raises more questions which will fuel hours of internet debate about things alluded to but not explored, and still manages to have a decent amount of Bruce Willis inflicting machine guns on everyone. Well played. This entry was posted in Film, Reviews and tagged Bruce Willis, Joseph Gordpn-Levitt, Looper, paul dano, Rian Johnson, Time Travel. Bookmark the permalink.